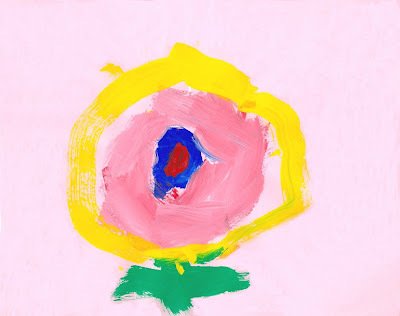 After learning about Georgia O'Keeffe and her flower paintings, the children fill their papers with single flowers. For all ages. Plan 1 to 2 sessions. More information about Georgia O'Keeffe can be found on the O'Keeffe Museum website. 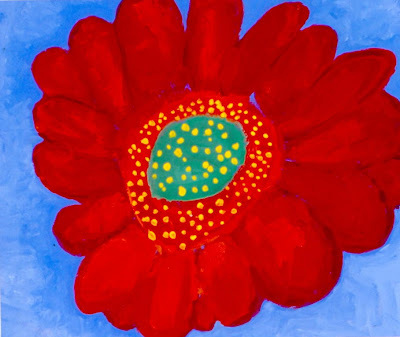 Most every year there is a Georgia O'Keeffe wall calendar for sale that has examples of her flower paintings to share with the children. Best known for her flower paintings, Georgia O'Keeffe often used striking viewpoints to draw attention to her subject matter. She painted her flowers so large that they had to be noticed and seen in a new way. O'Keeffe was born in 1887 in Wisconsin, the second of seven children. She grew up close to nature on a large farm. As a child, she had a rebellious temperament and found school dull and constricting. 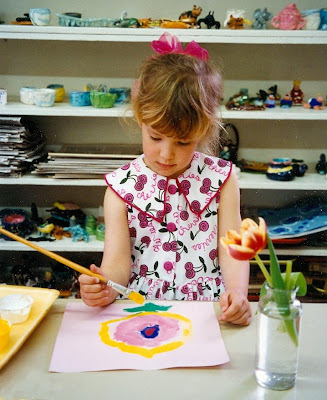 By age ten, she had already decided that she would grow up to be an artist. After studying art in both Chicago and New York, O'Keeffe spent several years teaching in an elementary school and later in a college. In the early 1920's, she stopped teaching and moved to New York to marry Alfred Stieglitz, a well known photographer. In the busy city, she felt that people did not take time to appreciate the small wonders of nature. To draw their attention and force them to look more carefully, she painted flowers larger than life, often filling the complete canvas with a single flower. After her husband died, O'Keeffe moved to New Mexico and painted the nature she loved so much. She was ninety-eight years old when she died in 1986. Sponges to dry brushes after rinsing. Cut flowers with simple shapes, such as Gerbera Daisies, Anemones, Alstroemerias, Sunflowers, and Daisies - plan one flower for every two children. Become familiar with the life and works of Georgia O'Keeffe. Gather examples of her flower paintings. Set out paints, brushes, containers of water, sponges, and construction paper. Set out one cut flower in a vase for every two children. Display the examples of O'Keeffe's flower paintings. As the children look closely, tell them about her life and her work. Explain that making something larger than life catches our attention and causes us to look more closely. 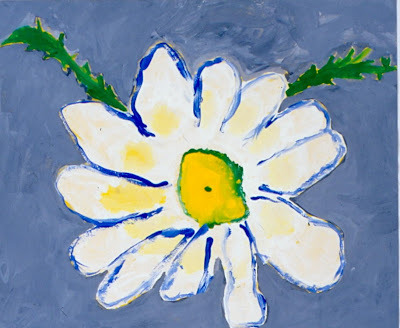 Like Georgia O'Keeffe, the children will be painting single flowers that will fill their papers. Holding up a flower, ask the children to look carefully at its parts. Point out the simple shape of an individual petal and the way that shape is repeated over and over. Look closely at the center of the flower and its texture. Discuss the variety of colors that can be found in a single flower. Using pencils, have the children draw the basic outline, or outer edge, of their flower on their paper. Encourage them to draw the outline so big that it touches or even goes off the edge of the paper. Explain that, since paint will cover up the pencil lines, small details in the flower will be added after the first coat of paint is applied. 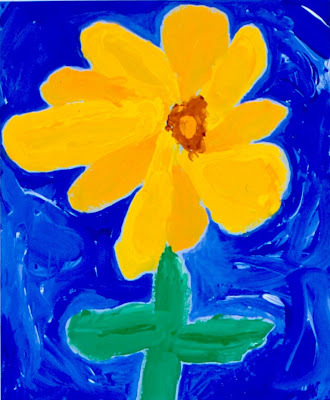 Have the children paint their flowers, closely observing the variety of colors. When the flowers are completed, the children should paint the backgrounds. To avoid covering the flowers, suggest that the children leave a little unpainted space around the flowers' edges. The little bit of construction paper showing through will set off the flowers nicely and keep some charming paintings from disappearing into the background. Note: Children ages three to six do not need to use pencils. Let them paint directly on their paper and allow the color of the construction paper to serve as their background. Live flowers are more inspiring than artificial ones and create a wonderful feeling of awe. Choose simple flowers with interesting colors. Be sure the children look carefully at the flowers and their parts before starting to draw or paint. Point out the simplicity of the flowers, which are actually made up of a few shapes, repeated over and over. It's important that the children have a clear view of the flowers they are painting. If possible, plan no more than two children to work with each flower. Do the flowers fill up the papers? Ask the children how working like Georgia O'Keeffe might encourage them to observe small things more carefully. Discuss how the children felt when painting in the style of O'Keeffe. This flower looks much too hard to paint. It’s hard to paint something bigger than it really is. Do I have to paint all the petals on this flower? The middle of my flower is full of yellow fuzzy stuff. Why do I need to paint the background? I like the color of my construction paper. It’s easier to paint your flower if you look carefully at each of its parts. To make the flower big, think about making its petals touch or even go off the edges of the paper. If your flower has lots of petals, you can decide how many to paint. You can make the middle of your flower look fuzzy by dabbing with the paint brush. Your painting will be more complete if the whole surface has a layer of paint. You can let the construction paper show through by leaving a little unpainted space around the outside edge of the flower.